Hi i am buying lobbies 250 ea my rs name is green098. when i start playing again i'll sell you so much you won't know what to do with them, i will need to fish and cook tons of Lobs for the 3mil cash i need to buy new armour. 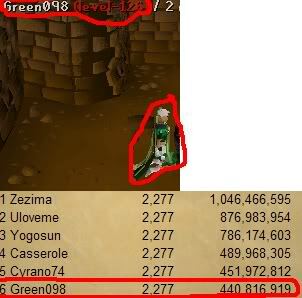 The-Bug wrote: Hi i am buying lobbies 250 ea my rs name is green098. Yes i remember youm seanryan were should we meet? i showed this pic to my clan XD ROFL i feel like such a loser..